How Many Carbs Should My Toddler Eat? 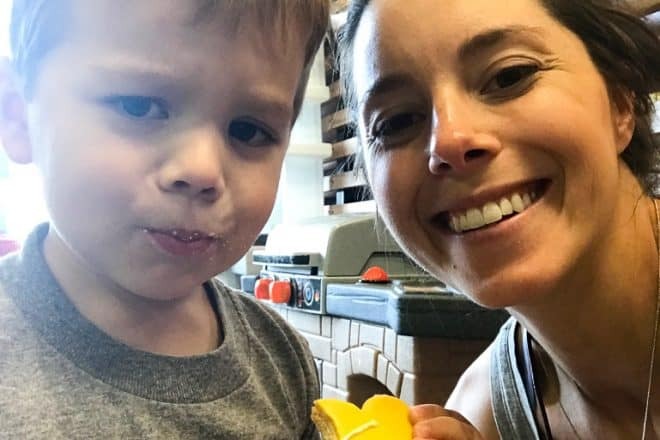 Moms, do you wonder if it’s okay for your toddler to constantly be eating carbs? Are they still getting the nutrition they need? Do you ever feel like your little one’s meal is only “healthy enough” or “good enough” based on how much protein and veggies they eat? Are you a protein pusher, asking your kids to eat more of their meat, after they gobble up all the carbs on their plate? Or do you worry that they are NEVER going to eat their green veggies, if they also have carbs to choose from on their plate? We tend to serve meals that have a focus on protein and veggies when we want them to be healthy, but for kids, that’s not the only important part of their meal. Carbs should make up 45-65% of your little one’s diet. So if you feel like they want all carbs all the time, and rarely want protein…they are probably right on target. When you look at your little one’s plate, or what they eat in a day, it’s totally normal for it to look kind of opposite of how your plate may look. Your meal of grilled salmon and veggies is likely not going to be as satisfying to your kid as it is to you. I’ll say it again… that is totally normal. Protein intake can be as low as 5% of their total diet and still be on target if they are 1-3 years old. That means taking a bite here and there of protein foods really is enough for them! Protein should be about 5-20% of a 1 to 3 year old’s diet, and 10-30% for kids 4 and up. That’s still not much when you think about it in terms of what’s on their plate. 5-10% of a meal is probably 2 or 3 bites worth. I just want to get the message across that if it looks like they barely touched their protein, that’s okay. We tend to serve them more than they need. I talk more about specifically calculating protein needs in this post. Just so you don’t think I forgot, fat is important too. When we look at percentages of total calories, we recommend about 30-40% fat for 1 to 3 year olds, and 25-35% for ages 4 and up. Carbs should be a part of every meal, and most snacks. Little kids burn through energy quickly. Adults sometimes say they feel sluggish or tired after eating a carb heavy meal. Have you ever noticed that with your toddler? I bet the answer is no. I would bet that their energy seems to multiply after eating a plate full of carbs! My “every day” carb list contains foods that you can feel good about serving, well, every day. These are foods that you don’t need to restrict or limit even if you are nervous your child is eating too much of them. At meal time, always plan to serve one or more carb choices. I often suggest that moms serve fruit with each meal, because little ones typically love fruit. And you can have peace of mind that they are getting vitamins and minerals with their meal. Here’s an example of a normal day of eating for a 3 year old. Let’s talk about snacks. Most of the snacks kids love the most are refined carbs like crackers, cookies, and chips. And goldfish. I think they are probably the favorite toddler carbs (why do they love them so much??). If you’ve ever eaten these foods, and I’m sure you have, you know first hand that they taste good, and can taste better than their real food counterparts. No matter how hard I try to convince my son that my baked sweet potato “chips” are just as good as packaged veggie chips, he knows I’m lying. I’m going to be posting about this in the next few weeks! If you liked this post, share it with a friend!